If you own or operate an industrial facility, it’s extremely important for your roof to have the right ventilation systems in place. It’s never a good idea to allow stagnant air to simply stick around inside of an industrial space because it’s usually filled with airborne contaminants that can harm both your employees and your equipment. By ventilating the air and keeping it circulating, you can reduce these contaminants and make your industrial space a safer place for people to work. In addition to getting rid of contaminants, a ventilation system that is installed properly in your industrial roof will also keep your space more comfortable as a whole. You won’t get that stuffy feeling that often comes along with a lack of ventilation. Instead, the environment in your industrial facility will stay cool, and the humidity levels will be dramatically reduced. You can also knock out pesky odors caused by your employees and equipment when you ventilate the air in your space. These things will make people more productive in the long run and make your facility a better place to work. While these benefits in and of themselves should be more than enough to encourage you to rethink your ventilation strategy, there is one other big advantage that comes with installing proper ventilation in an industrial roof. It will also reduce the risks of fires and explosions taking place. Disaster can strike when you don’t take the time to remove potentially harmful fumes from the air in your facility, and it could end up being catastrophic for you and your company. It’s why you should be as mindful as you can be about finding and using the right ventilation system. Is it time for you to either install a new industrial roof or put a new ventilation system into an existing industrial roof? 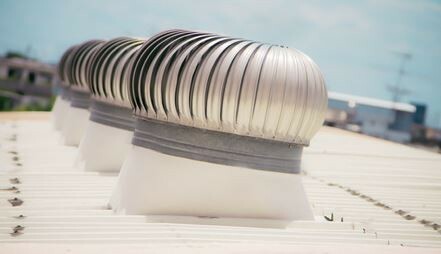 Ray Roofing Supply can assist you and show you the difference a new ventilation system will make. Call us at 330-452-8109 today to speak with one of our representatives about your industrial or commercial roofing needs.